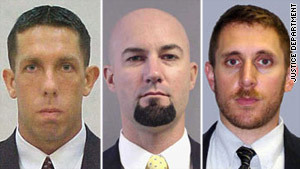 DEA agents, from left, Chad L. Michael, Forrest N. Leamon and Michael E. Weston were killed Monday. The military gave no further details about the bombings, which it said also wounded several other service members. The official said one service member was killed in one attack, while the other seven were killed in the other attack. The U.S. military described the bombings as "multiple complex IED attacks," which means they were followed by small arms fire, the official said. That has been the typical Taliban operational method for attacking U.S. forces in recent months, the official said. White House spokesman Robert Gibbs issued a statement of condolence: "As always our prayers go out to those who have lost a loved one and for those who sacrificed so much to serve our country." The attacks happened a day after 14 Americans were killed in a pair of helicopter crashes in Afghanistan. The 14 deaths were the largest number of Americans killed in Afghanistan in a single day in more than four years. With the deaths of two troops on Sunday, a total of 24 Americans, most of them military, have been killed in 48 hours. That makes October 2009, with 58 fatalities, the deadliest month for the U.S. military since the Afghanistan war began in October 2001. Enemy action was not thought to be the cause of either of Monday's helicopter crashes. Three Drug Enforcement Administration special agents and seven U.S. troops were killed in one crash in western Afghanistan as they returned from a raid on a compound believed to be harboring insurgents tied to drug trafficking. The DEA identified its agents as Forrest N. Leamon, 37, of Woodbridge, Virginia; Chad L. Michael, 30, of Quantico, Virginia; and Michael E. Weston, 37, of Washington. Leamon and Michael were members of the DEA's Foreign-deployed Advisory and Support Teams, and West was assigned to the agency's Kabul Country Office. Monday's other crash, in which two helicopters collided over southern Afghanistan, killed four Marines. It is roadside bombs, commonly referred to as IEDs, short for improvised explosive devices, that have caused the majority of U.S. fatalities in Afghanistan in recent months. Last month, Defense Secretary Robert Gates approved a deployment of up to 3,000 U.S. troops to Afghanistan to deal with the growing threat from roadside bombs. Such attacks have been on a steady rise since February and account for 70 percent of U.S. casualties in Afghanistan this year, according to U.S. military statistics. Compared with just two years ago, the number of American troops killed by roadside bombs is up 400 percent. "That's the No. 1 threat," Adm. Mike Mullen, chairman of the Joint Chiefs of Staff, said in July about IEDs in Afghanistan. Eighty-two deadly attacks occurred in June, almost double the number from May, and 105 in July, according to the latest U.S. military statistics. Maj. Gen. Curtis Scaparrotti, commander of U.S. troops in eastern Afghanistan, said he has noticed an "increasing sophistication" in the types of IEDs used. "We're seeing some of the tactics, techniques and procedures that were used in Iraq, and [were] common there, migrate, obviously, here," Scaparrotti said in a recent briefing on operations in his area of command. CNN Pentagon producer Mike Mount in Washington contributed to this report.